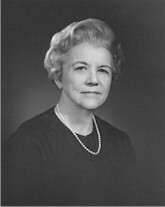 BAKER, Irene Bailey, (wife of Howard Henry Baker and stepmother of Howard Henry Baker, Jr.), a Representative from Tennessee; born Edith Irene Bailey, November 17, 1901, in Sevierville, Sevier County, Tenn., attended the public schools of Sevierville and Maryville; studied music; deputy county court clerk, 1918-1922; deputy clerk and master, Chancery Court, Sevierville, Tenn., 1922-1924; Republican National Committeewoman for Tennessee 1960-1964; elected as a Republican to the Eighty-eighth Congress to fill the vacancy caused by the death of her husband, Howard H. Baker, serving from March 10, 1964, to January 3, 1965; was not a candidate in 1964 for renomination to the Eighty-ninth Congress; director, Public Welfare, city of Knoxville, 1965-1971; was a resident of Knoxville, Tenn., until her death in Loudon, Tenn., on April 2, 1994; in Sherwood Memorial Gardens, Alcoa, Tenn.
Irene Bailey Baker in Women in Congress, 1917-2006. Prepared under the direction of the Committee on House Administration by the Office of History & Preservation, U. S. House of Representatives. Washington: Government Printing Office, 2006.